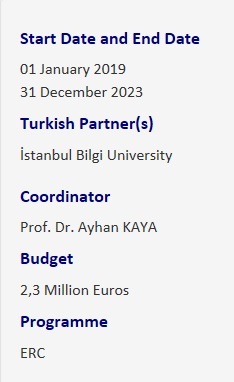 In this research project funded by ERC; Prof. Kaya will build on the work he has been doing for decades on trying to understand the reflexes developed by Muslim youth and native youth living in Europe. The main aim of the project is try to understand these two social groups with a single scientific lens/perspective and to criticize the culturalist paradigm. The project claims that young people, whether indigenous or immigrant-origin, respond to similar threats such as deindustrialization, isolation, denial, humiliation, precariousness, insecurity, and anomia, which have different reflections on globalization, in a similar way. These responses tend to be radicalized in the face of current socio-economic, political and psychological disadvantages. While a number of indigenous young groups are shifting to right-populism, a number of Muslim youths are shifting towards Islamic radicalism. In the past, young groups, which tend to be radicalized in similar socio-economic, political and psychological conditions, use the discourses of leftist ideologies, today they are interested in the right populism or solemn religious discourse. The research project lies in an intersection between political science, sociology, anthropology and psychology. The project has a team of well-known European scientists from Germany, Belgium, France, the Netherlands in the Advisory Board and Ethics Committee. The field work will be carried out in Germany, Belgium, the Netherlands and France and the information will be collected through in-depth interviews with indigenous groups of young people and Morocco-origin/Turkey-origin young people living in different cities of these countries. The results of these project is expected to provide a paradigmatic transformation in the studies of youth, radicalization and marginalization. Throughout the lifetime of this project, in addition to the Principal Investigator, a political scientist PostDoc researcher and a social physchologist PostDoc researcher will be employed. The project team also consists of six international consultants and three ethics committee members who are well-known in their respective fields. Also, five five PhD students from the EU countries and Morocco will be employed for the field research starting from 2020.